Slot machines are getting incredibly popular, even more than before. They are expanding like wild fire, and are set to pop up in the weirdest locations. At Indian Head Park in Illinois, specifically at Bonny’s Bistro, will serve not only food and beer, but also have five machines installed, so patrons can play while they eat. Five may not seem like a large enough number to cause panic or even bring in the amount of players you would see in Las Vegas, but this will open the doors where other regular establishments can get their gambling license and install a few slots. Seeing as how the Wolf’s Head Restaurant & Bar in the same shopping center also has a license. 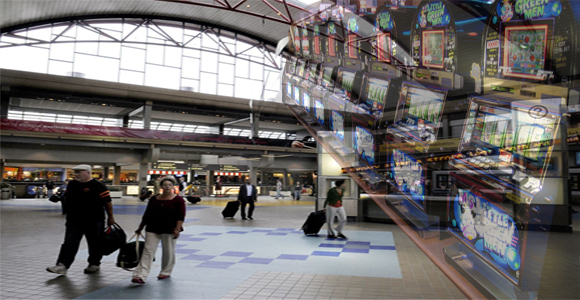 On top of this, it would seem that the international airports in Pennsylvania’s are considering installing slot machines. They say it would be a great way to keep passengers entertained and distracted while they wait for their flights. This is one of the plans that Pittsburgh, and other cities have of trying to increase revenue into the airports. Considering the fact that slots are a huge part of bringing in revenue in Vegas, it could do wonders for even the smallest establishments.